In a few days from now you will be bringing your new Miniature Schnauzer puppy home in the car. How will that experience be for puppy? With the excitement of this new pet joining your household, have you stopped to think how puppy will react to the car, the noise of the engine starting up, and the first time without his mother or siblings. Not only could the journey home be hard for your new Miniature Schnauzer puppy, it could be difficult for you unless you carefully prepare for the journey. Ideally you should arrange for a friend or family member to be with you to bring puppy home. Ask someone who is able to take over the driving for the journey home with your puppy. Whether the journey is long or short, you need to be free to look after your new Miniature Schnauzer puppy, while the other person drives the vehicle. Arrange with the Dog Breeder the time you will be arriving to take charge of your puppy. Request that puppy does not eat any food within 2 hours of leaving the breeder’s premises for your trip home with puppy. The last thing you need is for puppy to be car sick, nor to urinate in the car. Let the Dog Breeder know that you want to spend some time, maybe up to 15 to 20 minutes, with puppy getting to know you before you get in the car. Parting your Miniature Schnauzer puppy from his mother and siblings is hard on him. Therefore, he needs your full attention. This is the reason why you need somebody to drive the car to your home. The back seat of the car is the best place for you sit on the journey home. Have a blanket and preferably a waterproof sheet under the blanket, to put on your lap. Place puppy on the blanket, on your lap, and keep puppy calm with stroking and patting him, and generally making a quiet and calming fuss of him. 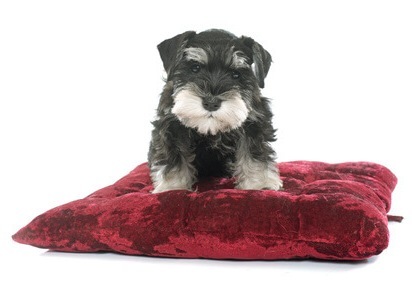 Even though you do your best to keep your new Miniature Schnauzer puppy calm, don’t be surprised if he cries. This is very natural behavior for a puppy when he finds himself in a strange place, with someone he has never met before. If you are not able to have someone drive you and your puppy home, then you will need to have a crate to place puppy in for the journey home in the car. Put the waterproof sheet and blanket into the crate for puppy to sit on. Secure the crate door firmly. Put the crate on the back seat of the car, and secure it in the best way possible. This depends on your vehicle. On arriving home with your puppy you need to give him/her extra loving to make up for that journey home feeling very much alone. Whatever the journey, puppy is sure to be hungry and a little light meal for him would be welcomed. This is very first step for building the relationship between you and your delightful new puppy. I congratulate you on your new Miniature Schnauzer puppy and wish you both very many years of happiness together. If you need help with your puppy I recommend checking out Doggy Dan’s easy way training. Clicking here will give you access to more about what Dan’s training offers.